I’ve been sick all weekend, and my brain is still a little bit fuzzy. Still, I’ve been trying to figure something out: what does President Obama really think about the deficit? Did he cave in to Republicans because he didn’t have much choice, or does he really think that cutting the budget is a good idea? I think it’s worth remembering a few important things. 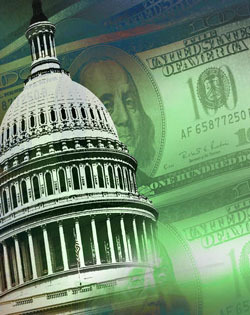 First, the federal government did not need to cut spending in this fiscal year. There is no immediate fiscal crisis; on the contrary, yields on American government debt remain extraordinarily low. Second, macroeconomically speaking, now is a bad time to be cutting spending. The economy remains very weak, state and local governments are already trimming back public spending and placing a big drag on economic activity, and there’s plenty of contractionary developments in the pipeline already, from the impending end of QE2 to the impact of rising oil prices….Third, had America actually been facing a crisis or had it simply been an opportune moment to trim back state spending, this was just about the worst way to go about cutting. The cuts don’t touch on the real sources of the long-term budget problem. This is pretty much the conventional wisdom among left-of-center economists, and my guess is that Obama agrees. But if so, why did he agree to the Republican cuts? He might have felt like he was over a barrel and had no choice, but that still wouldn’t explain why he talked about the deal so enthusiastically after it was done. There has to be more. But what? My best guess is also the most boring one: He actually thinks the cuts are a good idea. Macroeconomically they don’t make sense, but as a signal they might be pretty powerful. Here’s how. Most center-left types think that our first best economic policy option is more spending now, while the economy is still weak, combined with much less spending in the future, when the long-term deficit threatens to spiral out of control. But Obama probably figures, correctly, that the deal he cut during the lame duck session last year was the last stimulus he was going to get. More spending just isn’t in the cards. So what’s the second best policy option? Well, the biggest problem with the first best option has always been that it’s not credible. You need some way of signaling the market that you’re serious about long-term deficit reduction, and there’s really no way to do that as long as you’re spending gobs of money in the present. That might be a risk you’re willing to take as long as stimulus spending is feasible (since the substantive gain of the stimulus outweighs the drawback of lost credibility on long-term cuts), but it’s not worth taking once further spending is out of the question. At that point, the long-term signal becomes your most important policy goal. So my guess is that (1) Obama is serious about wanting to rein in the long-term deficit, (2) he thinks the cuts in this year’s budget are a good way of signaling his seriousness, and (3) he also thinks that a few tens of billions of dollars in lost spending will have such a minor macroeconomic effect that it’s a small price to pay. Now, I’d also guess that the last few months of economic data have persuaded Obama that the economy is rebounding, which makes the risk of cutting current-year spending even less. I’m not so sure about that, myself, but there’s no question that economic signals are mixed right now. We’re obviously headed for a slow recovery at best, but probably a recovery nonetheless. So, anyway, that’s it: my best shot at reading Obama’s mind. I suspect Obama really is a long-term deficit hawk and figures that the current budget battle, though not really of his choosing, can be turned to his advantage. He’s agreed to cuts but has also shown that he’ll fight against crazy cuts, and he thinks that will help him take the high ground when he unveils his own long-term deficit program on Wednesday. This isn’t how the events of the past week look to us liberals, of course, but I’ll bet it’s approximately what they look like to independents. And as we’ve all learned over the past couple of years, Obama doesn’t really care much about how liberals view events. Will the Public Blame Paul Ryan if There’s a Shutdown? Is the Deficit a Crisis?